Well, some of you may have seen this tweet of mine, announcing that I’m embarking on a new, somewhat daunting project–a new court gown to be completed in time for Grand Valley’s 20th annual renaissance faire this fall. I was one of the original members of the duchess’s court at Grand Valley fifteen years ago and it only seems fitting to me (and to other alumni as well!) that my Irish-born countess returns to celebrate the twentieth year of the festival. Of course, this means I need a new gown. 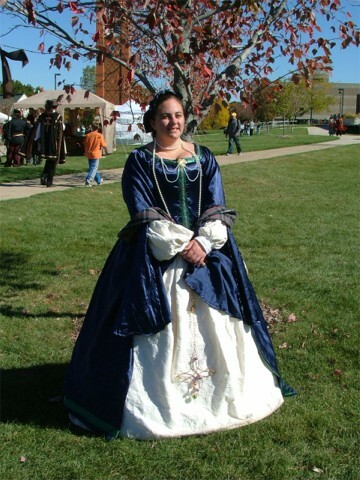 About eleven years ago, I completed my first Tudor, a blue and green one with cream undersleeves and forepart. It wasn’t bad for a first effort, but I made some poor fabric choices and the bodice and sleeves didn’t turn out quite the way I wanted them to. The hat is a disaster (though it looks okay in pictures) and the overskirt was far too light and had a tendency to blow around quite a bit. 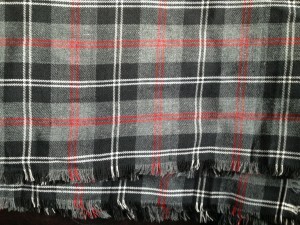 I’ve long since packed away this garb and forgotten where I’ve tucked it. Still, I was pretty proud of the accomplishment–I’d made the gown and all the underpinnings, including the corset, shift, and farthingale. In fact, the only thing I’m wearing in that picture that I didn’t make myself is the shawl that you can see looped around my elbows, which is the only piece of my garb that I’ve worn with every single iteration of my garb. Seriously! Everything I’ve ever done has this shawl with it. 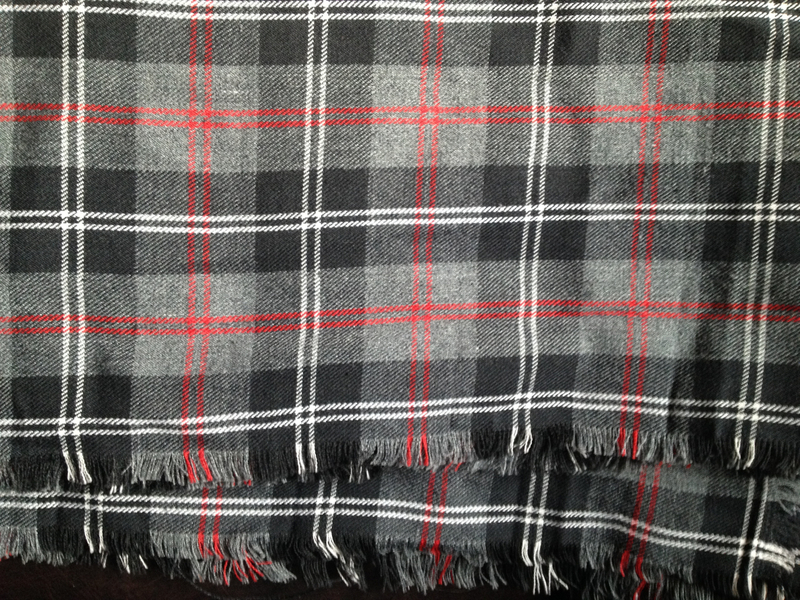 The infamous shawl, purchased at Hollygrove in September 2000. Last weekend, my mother and I headed out to one of our two local JoAnn’s–she on a mission for costuming supplies for the high school production of Disney’s Cinderella, me with the idle thought that maybe, just maybe, I’d finally pick up supplies to make a new Tudor gown, since I’d been talking about making a new court gown for at least the past five years (Jen, Kristie, Trish, or Diane might know exactly how long I’ve made noises about doing it). I grabbed some of my reusable shopping bags, threw one of my beautiful Son of Sandlar boots into it (so I could color-match the wine-colored leather that makes up the body of my boots), and headed out on my hunt for appropriate fabrics that would work for a new court gown and coordinate with these boots, because god knows that I spent enough money on the boots–I’m going to wear them with all of my garb, dammit! I’ve always known that I wanted to do one of two things for a new court gown: either a subtle brocade gown, or a velvet gown–and if I was going velvet, it had to be cotton velvet, because there’s no way I’m dry cleaning this monster every time I wear it. That would just be silly! In fact, the ideal combination would be something I could machine wash from underpinnings on up to the overdress, but that can be super hard to find when you’re dealing with these things. In this, I completely lucked out–JoAnn’s had a full bolt (12 yards) of black velveteen on a roll and I had a 50% off one item coupon (which, by the way, stacked with my 20% off total purchase coupon). Buying fabric for these types of gowns can be total sticker shock, so it’s not for the faint of heart, but I’d gone in knowing that this was something I wanted to do on this particular shopping trip, so I went ahead and did it. I spent about $72 for the full bolt of velveteen. When you’re getting ready to do something like this, make sure you buy as much fabric as you think you might need, since dye lots can be different between bolts and you don’t want to end up with different colors of black in your gown. She’s known about my desire to make a new court gown for a while, too. 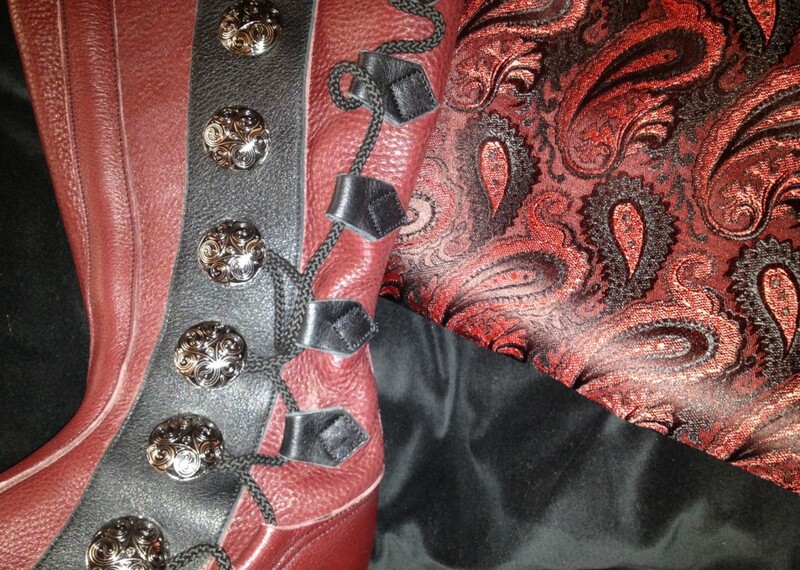 Velvet, brocade, and my boot — the beginnings of my new court garb. In the end, she helped me pick out some red and black brocade for the forepart and sleeves that read well with the velvet and with my boots. I’ll just have to figure out what kinds of trims I’ll use for the whole thing, but that comes later–much later! Of course, I’ll have to make new underpinnings, too. My size has changed a bit since I made my initial corset, and my farthingale is a mess these days–Renaissance dancing will do that to you, especially when you’re all just learning to do it for the first time. So yesterday, we went back to JoAnn’s (Mom needed more fabric for more costumes for Cinderella, and I needed fabric to make a new corset, the back part of my underskirt, and a new farthingale) and I got some denim on sale that should be the trick nicely (the canvas at JoAnn’s is ridiculous and the cotton duck wasn’t on sale–the cream and black denim yardage I got will work for what I need). A trip to Lowe’s yesterday afternoon netted me the cable ties I needed for the corset boning and the tubing I need for my farthingale. All in all, I’m super excited. It’s been a while since I’ve embarked on a project this ambitious, but I think it’s going to be great. This entry was posted in Projects and Experiments and tagged court gown, Lady Brigid's Wardrobe, new tudor. Check us out at Etsy! Six weeks until GVRen 2014! The only free, student-run, student organized Renaissance Festival in the state of Michigan - this year was the fifth vending year for Jude's Chest. Donations at this show benefit the Athens High School band program. Proceeds from admission and booth fees go toward the instrumental music program at Henry Ford II High School.